Oh man, you guys. This weekend. It was a doozie. The back story you may need, because I don't think I've mentioned it on here before, is that Roger and I signed on our first place a few weeks ago, and we're looking forward to moving to Harlem in about two weeks. We're both really excited for different reasons, but also, turns out that moving in with someone you adore isn't really that much less stressful than any of the other moves I've made. You may not know this about me, but I don't handle change well, and I hate packing. I don't like packing for weekend trips or long vacations or school-years, and I seriously, seriously do not like packing up every object I own, including approximately a billion books. I actually don't totally hate the process of moving, despite the fact that every single time I've ever done it (and that's a total of 14 times between 2004-2009) it's been either over 90*F or raining, because it signals an end to the packing, and a beginning to my favorite part of moving: settling in. I'm pretty sure I've never moved without shedding at least one tear, and sometimes I end up heaving and then passing out from hyperventilating. Like Saturday. I'll spare you the details, but let's just say I'm not great at compromise and also life-transitions are just hard. So, let's focus on the good parts of this weekend, which don't involve wrapping twine around books or donating the world's largest garbage bag of clothes. The Tessa - "My Tessa Collection is a classy nod to mid-century modern style! Tailored beautifully throughout, like a well-made, expensive suit! 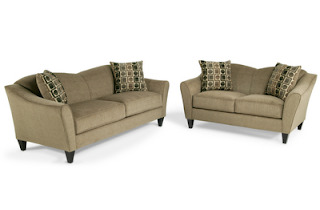 The coordinating decorator throw pillows in neutral colors, will match any decor. This high end look would cost hundreds, if not thousands more in those hoity-toity stores. Why pay more?! Get the same look and save a bundle! Only at my Bob's!" What We Like: much nicer fabric in a better color, smaller structure would fit better in the apartment, fancy shape and overall design, remarkably comfortable. The Rowley - "My Rowley Collection is a storage lover's dream. 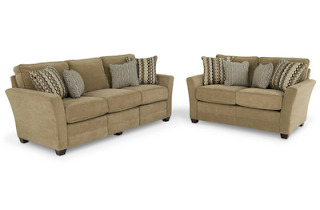 The sofa, loveseat, chair and ottoman, all have built in storage compartments. Tidying up the living room has never been easier! Hide magazines, remotes, blankets, toys and more...in the blink of an eye! You get comfort, style, and storage galore without breaking the bank! Only at my Bob's! Why pay more?" What We Like: storage drawers under your legs, having an individual middle cushion, slightly more comfortable than the Tessa, bigger/better for sleep-overs. We've been taking votes on Facebook and gmail to see which one to get, but if you've got opinions, let me know! Right now, the Rowley is in the lead, but it could be anyone's game. We also stopped at Stew Leonard's, which I loved as a kid because of all the singing animatronics and petting zoos and free samples, and which I love as an adult because of their amazing food selection and good work practices and free samples. During our successful communal food experiment senior year of college, we had a Stew's just a few miles away, and we went at least twice a month. Now, we probably go closer to twice a year, but it's still just as appealing. Spending part of Sunday afternoon there made the whole weekend seem better, and the really delicious-looking lobster rolls they had out just made us all the more excited to go to the beach next weekend. oh stew leonards! apple cider doughnuts and creepy robot cow things! kristin, i think i might switch my vote to the "tessa." I'm sure this is a long shot, but would you happen to know the manufacturer of the Rowley sofa.. Or remember what the price was about? I believe I'm looking to purchase that same sofa but used and trying to get some info on it..